Tujuan penelitian ini adalah untuk mengetahui apakah pembelajaran matematika dengan metode Problem Posing berbasis pendidikan karakter di laboratorium TeenZania pada materi garis singgung lingkaran efektif. Populasi dalam penelitian ini adalah peserta didik di SMP N 2 Pati. Sampel dalam penelitian ini diambil dengan teknik cluster random sampling. Variabel dalam penelitian ini yaitu keaktifan sebagai variabel independen dan prestasi belajar sebagai variabel dependen. Cara pengambilan data dengan lembar pengamatan dan tes. Data diolah dengan uji banding t dan uji pengaruh regresi. Hasil penelitian menunjukkan bahwa prestasi belajar kelas eksperimen (82,74) secara statistik melebihi KKM (75). Dengan uji regresi linear sederhana diperoleh persamaan regresi ?=-15,847 + 1,194X dan R^2=0,829. Koefisien X merupakan bilangan positif sehingga keaktifan berpengaruh positif pada prestasi belajar sebesar 82,9%. Rata-rata prestasi belajar kelas eksperimen (82,74) dan rata-rata prestasi belajar kelas kontrol (72,91). Secara uji stastistik prestasi belajar kelas eksperimen lebih baik daripada prestasi belajar kelas kontrol. Berdasarkan hasil analisis disimpulkan (1) pembelajaran mencapai tuntas belajar; (2) adanya pengaruh positif pada keaktifan terhadap prestasi belajar; dan (3) prestasi belajar kelas eksperimen lebih baik daripada prestasi belajar kelas kontrol; sehingga pembelajaran matematika dengan metode problem posing berbasis pendidikan karakter di laboratorium TeenZania merupakan pembelajaran yang efektif. The purpose of this study was to determine whether the learning of mathematics by Problem Posing method in a TeenZania laboratory based character education in circle tangent material effectively. The population in this study were students in SMP N 2 Pati. The sample in this study were drawn by cluster random sampling technique. The variables in this study is the activity as an independent variable and learning achievement as the dependent variable. Method of data collection with observation sheets and tests. Data processed by the t test and the comparative effect of regression testing. The results showed that the experimental class learning achievement (82.74) was statistically exceed KKM (75). With simple linear regression test obtained regression equation Y = -15.847 + 1.194 X and R2 = 0.829. The coefficient of X is a positive number so that the activity has a positive effect on learning achievement of 82.9%. Average learning achievement experimental class (82.74) and the average learning achievement control class (72.91). In statistical learning achievement test experimental class is better than the control class learning achievement. Based on the results of the analysis is concluded (1) learning to achieve complete learning, (2) a positive influence on the activity of learning achievement, and (3) experimental class learning achievement is better than the control class learning achievement; that learning mathematics with problem posing method based on character education in the TeenZania laboratory is an effective learning. 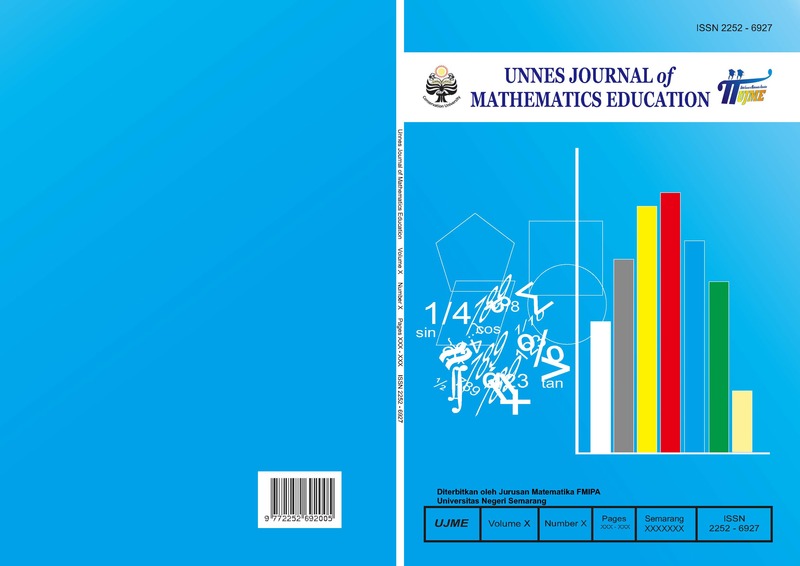 UJME is a peer reviewed and open access journal that publishes significant and important research from all area of mathematics education. This journal provides immediate open access to its content that making research publish in this journal freely available to the public that supports a greater exchange of knowledge. Submission of a manuscript implies that the submitted work has not been published before (except as part of a thesis or report, or abstract); that it is not under consideration for publication elsewhere; that its publication has been approved by all co-authors. If and when the manuscript is accepted for publication, the author(s) still hold the copyright and retain publishing rights without restrictions. Authors or others are allowed to multiply article as long as not for commercial purposes. For the new invention, authors are suggested to manage its patent before published. The license type is CC-BY-SA 4.0.